Long-established Kubota main dealer, George Browns Ltd, with six branches across central and eastern England, has supplied a pair of Kubota M7171 tractors to a local contractor, the first of their type to be ordered and delivered in Europe. The first two Kubota M7-series tractors have been supplied to a local contractor by main dealer George Browns. George Browns agricultural manager Roger Freeman (right) is pictured handing the keys to James Jolliffe at the dealer’s Chesham depot. James Jolliffe, whose business provides construction, fencing, hedge cutting and groundwork services, is based near Cholesbury, Bucks and serves customers within an hour’s car drive of his base although sometimes the specialist services he provides can take his teams further afield. Kubota launched its new large M7-series tractors in 2014. Designed to suit the needs of farmers and agricultural contractors and manufactured at a brand new facility near Calais in France which commenced operation late in 2015, the 3-model range offers power outputs up to 170hp, and a choice of power-shift or CVT transmission, and features such as a hydraulic lift capacity of 9t allow them to compete with other mainline tractors. 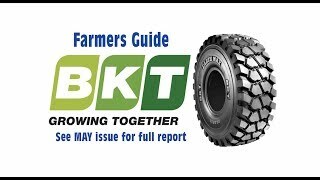 “We have always had an excellent relationship with George Browns,” explained James, “and the two tractors replaced by the Kubotas were supplied by the dealer about five years ago. They have been reliable and performed well, but when the franchise was transferred to a dealer further away, and Kubota announced that it was developing higher-horsepower tractors we were naturally interested, knowing we could rely on our local dealer for back-up. We had the opportunity to try out a prototype version of the new tractor, which was still under development, in 2014, and it impressed us and seemed to have everything we needed. Although James’ two previous mainline tractors were another brand, he has been a Kubota customer for many years and operates two tracked excavators; a 2 and an 8t version, a Kubota compact tractor and a dumper. “We are used to Kubota’s reliability and were confident that the new tractors would perform as they are designed to,” he said. Both tractors will be equipped with front loaders when stocks arrive in the UK and, while one is hedge cutting for up to 10hrs/day, 6 days per week, the other will be used to transport the excavators between sites and move aggregate with a large dump trailer. Other tasks include operating a post-knocker for long periods, erecting horse paddocks and livestock fencing. Kubota area service manager Mick Hancock (right) explains features of the machines to Ben Farnel – James’ foreman and one of the tractor’s main operators. Ben travelled with James to Germany to try out the prototype tractor, as James was keen to have an operator’s opinion before committing to the new models. 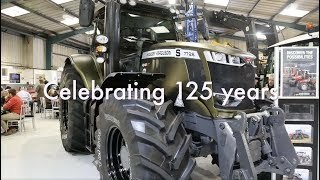 The tractors are protected by a 5-year, 5,000hr manufacturer warranty which, James said, is reassuring and, with a service package agreed with George Browns, he said he knows exactly how much the tractors will cost to own and run over the next four years. “We tend to update our tractors every four years, and the 5-year warranty means we will be able to trade them in with the benefit of a warranty in place, and that should help resale values,” he said.